During the first year of the Trump administration, states have grappled with many unanswered questions regarding the new administration’s views on value-based payments (VBPs) and how it would approach state-led or Medicaid based payment reform initiatives. These include to what extent existing efforts will continue to be supported or renewed, what mechanisms states can or should use to implement VBPs (e.g., DSRIP programs, 1115 waivers, 1115A waivers), what financial support will be available, and how much flexibility the Center for Medicare & Medicaid Services (CMS) will grant states in designing and funding innovative models. In the past eight months, CMS has revealed what it will look for in these initiatives moving forward, such as a desire to support state innovation. 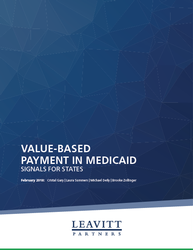 This paper provides a historical perspective on VBPs, including the health care system’s move away from payment models based on fee-for-service, and an overview of state models focused on value and quality. The paper also outlines the Trump administration’s key signals to date and how they might impact state VBP efforts in 2018 and beyond.